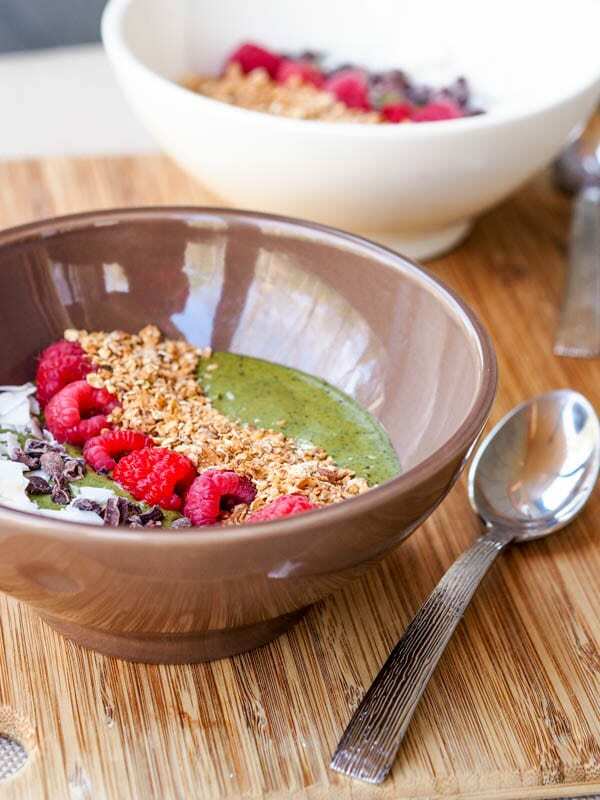 A flavorful and nutritious green smoothie bowl with spinach and acai. The best way to treat yourself and start the day is this refined sugar free breakfast. I am seriously obsessed with smoothie bowls nowadays. I never ever thought I could find something to love as much as I used to love having eggs for breakfast. But right now I am obsessed with this spinach acai green smoothie bowl. Lately, eggs just haven’t been doing it for me. I mean, don’t get me wrong I still love eggs but not as much as I used to. I’m noticing something a bit heavier about them. They’re almost too creamy sometimes and I feel a bit weighed down after eating them lately. Instead, when I wake up, more and more I find myself craving a nutritious and delicious colorful vegan spinach acai green smoothie bowl, topped with crunchy home made granola, sweet and fruity berries and all sorts of seeds for good measure. There’s just something so refreshing about this breakfast dish and I simply love all the different textures and flavors in one bite. From the creamy smoothie base to the crunchy granola to the tart and juicy berries. Each bite is simply brimming with flavor and it really seems to be the perfect way to awaken your sense, all of them at once, for the day. I’ve made a papaya smoothie bowl before, but this time I opted for a superfood charged bowl with the addition of spinach. It seems to me the banana really is a must in these bowls – as I’ve tried making them without it and it just isn’t as creamy for me. The banana really binds everything together and helps liquify that spinach for a perfect spinach acai green smoothie bowl consistency. Ah I just love this. No sugar refined, just naturally sweet enough and when topped with raspberries and my home made granola (any of them really) this is just perfect. After the week that I have been having this is exactly what I need for my body detox. I’ve spent the last week in Florida visiting my best friend and it has been a week of all sorts of indulgences. From eating late night pizza three nights in a row, to back to back margaritas on the beach, after this I’m going to be needing a lot of smoothie bowls. Luckily for me I happen to love the taste of them, so it’s no major sacrifice to give up sicilian pizza for an 11am breakfast wake up while rolling around in bed watching Empire — seriously my new favorite show. 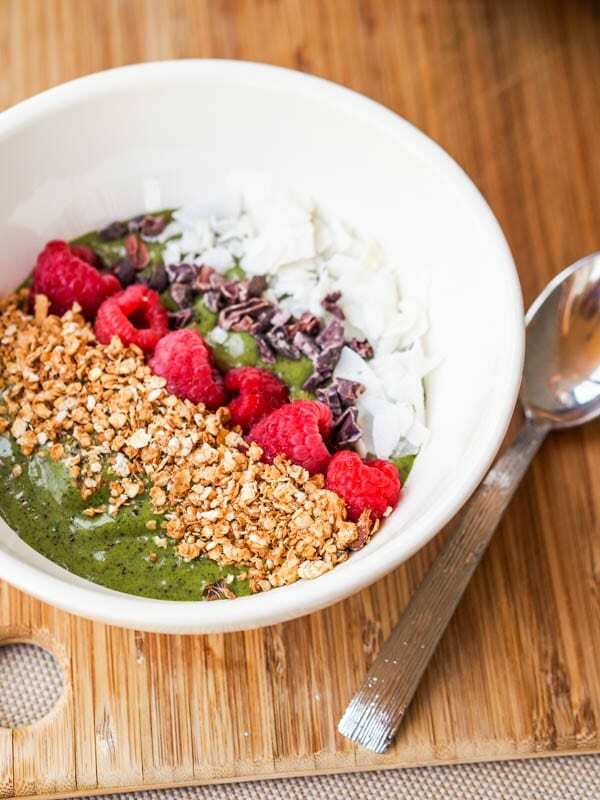 If you haven’t seen it yet I high recommend you do – it’s addicting, so better yet plop down on the couch with a large vegan banana spinach acai green smoothie bowl for some guilt free watching. Looking for another acai bowl recipe? Be sure to check out my vegan acai papaya smoothie bowl! Or if you want your breakfast in drinkable form be sure to try my spinach breakfast smoothie or my kale smoothie! Both super nutritious and delicious! 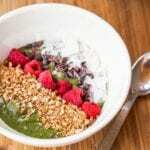 A flavorful and nutritious green smoothie bowl with spinach banana acai and maca. The best way to start the day and feel energized all day. 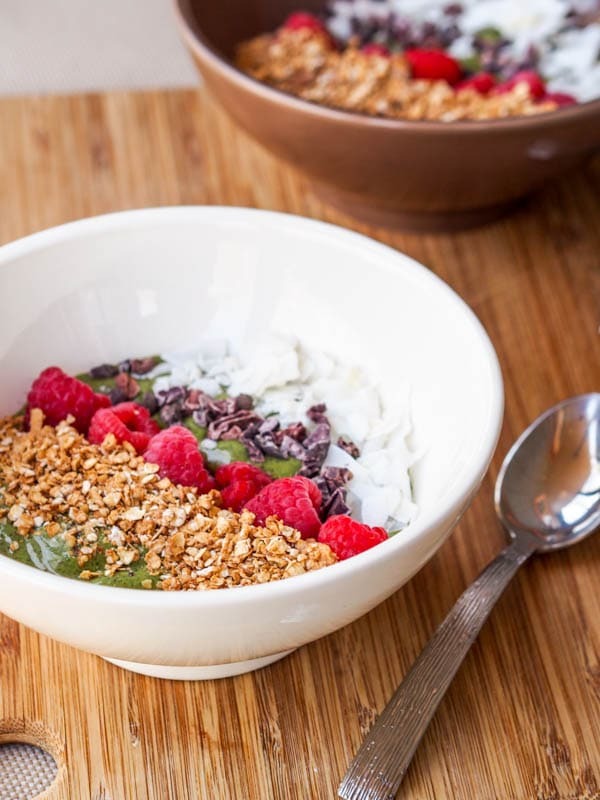 Treat your body to this delicious refined sugar free breakfast. Wow this looks amazing! I’m loving green smoothie bowls and the acai is a great addition!! This looks so refreshing, perfect for summer mornings!